What's out? What's coming? Have a look! Single figures are labeled 525 yen, which at current exchange rates would probably put them at US$6.50-$7.00. Importers may tack on extra fees to cover freight from Japan or their own expenses. Multipacks seem to be priced accordingly. 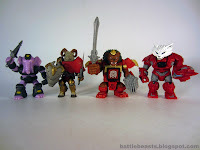 They are a hair above the original 1980s Battle Beasts, and in line with Diamond Select's Minimates Battle Beasts. The bulk of the figures each include a minimum of 5 accessories: a weapon, a shield, a trading card, and a pair of dice. Three-packs appear to include bonus accessories, like a mat or an extra die. How many are there? Will there be more? Lots, and seemingly no. 24 blind-boxed figures, about a dozen from multi-packs, and a healthy smattering of singles have come and gone and as of mid-2013, it seems this line has run its course. Hasbro doesn't seem to be bringing this to the USA, either. Is it "Beast Fight" or "Beast Saga?" The Manga is "Beast Saga" and the Japanese name "ビーストサーガ" seems to translate accordingly. There seems to be some difficulty in getting the names right on the individual figures, too. Stores like Big Bad Toy Store and Robot Kingdom. Are there proper English names for these guys? Sort of. Takara-Tomy has some English names in the URLs for the trading cards, which you can find here. We're going to use those for the names in the checklist, but we'll include other common names too. Will these come to non-import toy stores the USA? Unknown. If they're as small as it seems, the dice in the stomach are a small projectile-- it is tough to tell, but these could be a choke hazard. 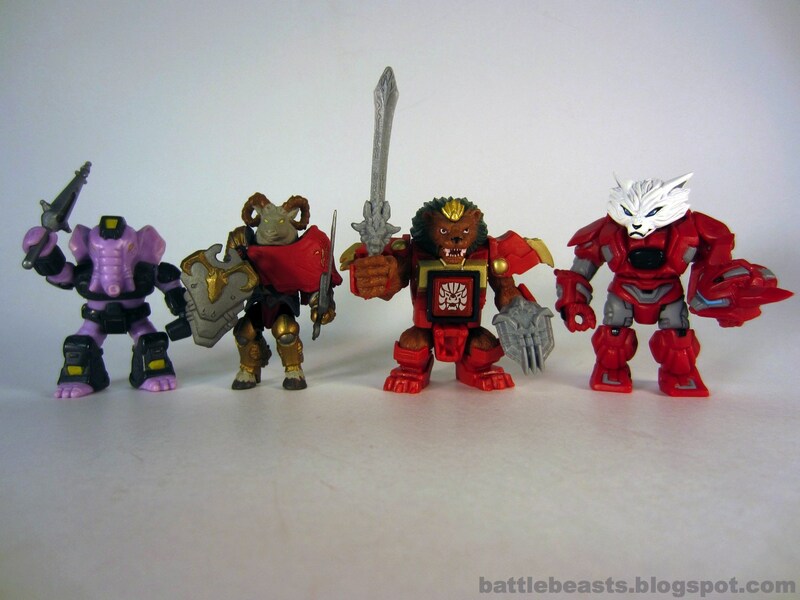 Diamond Select Toys will be doing their own Battle Beasts line, but it is possible Hasbro will import this Takara-Tomy line much like they brought over Beyblade and Transformers. It's also possible they have the rights to bring the line over and won't, much like Zoids since roughly 2004. Last edited 06/13/2014. Editors of this site fully cop to ignorance of the Japanese language on the solicitations. There may be name/translation errors present.